Are you in a chicken rut? I think back on the days when I considered making marinated chicken and white rice a major feat of cooking. Then I make a dish like Rachael Ray's Deluxe, Divine Chicken Divan from Express Lane Meals and realize how far I've come. I mean, a tarragon cream sauce with mushrooms? Hello! This is what Rachael calls a "I can't believe I made this" meal. While the rice cooks, season chicken with salt, pepper and poultry seasoning. Dredge chicken in about half cup of flour then discard the rest. Heat a large skillet over medium to medium-high heat. Add 2 tablespoons extra-virgin olive oil, 2 turns of the pan, and 1 tablespoon butter to the large skillet. To the hot butter and oil, add the cutlets and cook 3 to 4 minutes on each side. [Because they are thin little guys, they cook fast.] Remove the meat to a large platter and cover with foil to keep warm. Return chicken skillet to the heat and add 2 tablespoons butter. Melt butter, add the mushrooms and saute for a couple of minutes. Whisk in 2 rounded tablespoons flour. Cook the flour 1 minute then whisk in 1/3 cup white wine, a couple of glugs. Cook off wine, 30 seconds, then whisk in 1 1/4 cups of chicken stock (remainder of the quart) [I had to open a new box to get the full amount, since I used extra for my rice, but no big deal since I cook with the stuff all the time] then the half-and-half. When sauce bubbles, stir in mustard and tarragon and let sauce simmer and thicken 2 to 3 minutes. Stir scallions into rice and fluff with fork. Make a bed of rice on each dinner plate. Top with a serving of steamed asparagus then 2 cutlets of chicken. 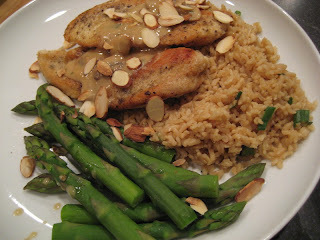 Cover the chicken with the tarragon sauce, allowing the gravy to spill over edges into asparagus and rice. Sprinkle the plates with toasted nuts. Wow! Can you believe you made this?